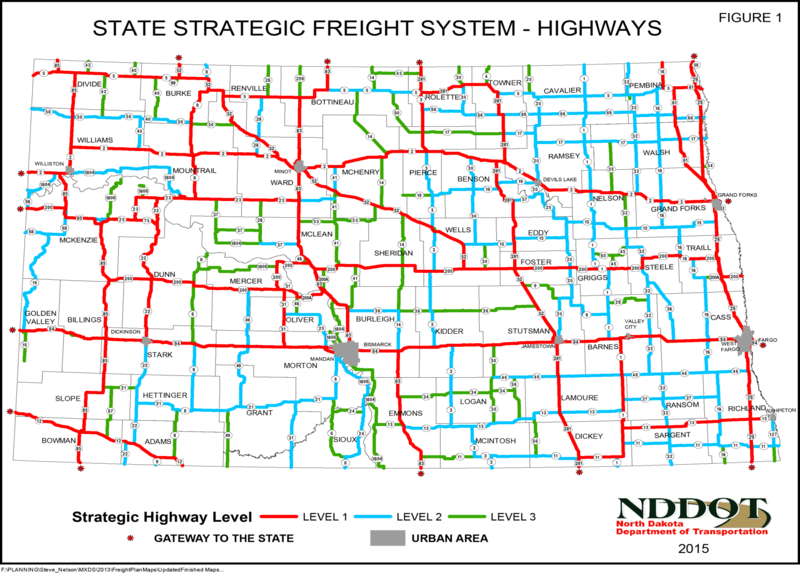 The NDDOT has worked in partnership to develop a plan to advance a freight transportation system that would meet North Dakota’s unique freight challenges while complementing the goals of the National Freight Network. By reaching out to our stakeholders, the general public and surrounding states and provinces, freight system trends, issues, and needs have been identified. North Dakota’s Freight Transportation Plan was adopted in April 2015. As we move forward with the implementation of North Dakota’s Freight Transportation Plan, we pledge to work with our stakeholders to facilitate a freight system that will be where it needs to be in comparison to where the world is going to be. The material in these documents can be provided in alternative formats, for example: large print, Braille, sound recording, or computer accessible, for people with disabilities or with limited English proficiency (LEP). Contact Civil Rights Division at 701-328-2576, or the Civil Rights Division Contact Form at least 10 days prior to the date the translation is needed. TTY users may use Relay North Dakota 711 or 1-800-366-6888 to contact Civil Rights.